With a default width of fi ve pixels for the window frame, the Aero eff ects make Window borders very thick. A little less space should be wasted on smaller monitors. 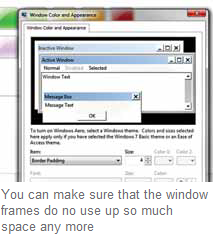 This waste of space can be minimized by adjusting the window frame to make it narrower. In Windows 7, right click a free space on the desktop and select the context command ‘Personalize’. In the next step, click the link ‘Window color’ and follow the link ‘Advanced appearance settings’. In Vista too, right click the desktop and select ‘Personalize’. In the dialog, go to ‘Window color and display’ and follow the link ‘Open properties for classic display to show other options’. In the ‘Display options’ dialog, click ‘Advanced’. From the next step, the procedure is the same in both systems. In the first selection list, now select the entry ‘Border padding’ and make the desired setting. The default value is ‘4’; the setting ‘0’ sets the frame to a minimum size but it nonetheless remains visible. Confirm the change with ‘OK’. The setting will immediately become effective.